Wilf Toman was born in Bishop Auckland but played his early football in Scotland. He joined Burnley from an Aberdeen junior club in December 1896 but was unable to do enough to prevent the Turfites relegation in 1897. It was a different story the following season with Toman leading the attack as the club swept to the Second Division Championship and his formidable scoring partnership with Jimmy Ross brought 38 of the team’s 80 goals that season. During that successful Turf Moor campaign Wilf Toman, who was a qualified teacher, proved that his talents lay not just in his feet when he was appointed to a position at a Burnley school. He was Burnley’s top scorer the following campaign, during which he won his only international honour when he represented the Football League in a 4-1 win against the Scottish League in Glasgow early in 1899. 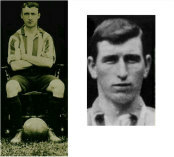 Shortly afterwards he was transferred to Everton and then in 1900 he joined Southampton, where he featured regularly as the Saints won the Southern League Championship in 1901. He later returned to Everton where serious injury ended his football career and he went on to work as a ships’ steward. During the Great War Wilf Toman joined the Kings Liverpool Regiment where he became a Lance Corporal. He was killed in action at the Western Front.